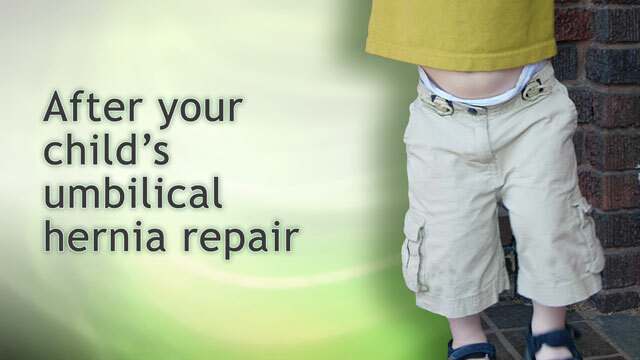 So what do you do after your child's had an umbilical hernia repaired? I'm Dr. Alan Greene with some tips for home care after that operation. Well, the first thing to know is that your child will probably go home with a bandage over the surgical site that's best to leave in place until your return visit to the doctor or until your doctor tells you to take it off. And while that bandage is there you want to keep that area pretty dry. That means usually sponge baths, not real bathing, not swimming certainly until it's time for that bandage to come off. Your doctor probably will give some pain medication for your child, especially that first couple days it can be pretty tender afterwards, so it's nice to give that pain medication around the clock when they're awake to kind of stay ahead of the pain instead of waiting until you know that they're uncomfortable. They can pretty well eat what they want once they go home and more or less normal activity. You'll want it kind of quiet for the first 3 or 4 days, but after that they can resume completely normal activity except for rough sports - you probably want to hold off for about a week or so to let that incision really strengthen. When should you call the doctor? It's a good idea to call the doctor if your child develops a new fever sometime afterwards over 101° or so. If their pain is increasing at any point or if they're having trouble urinating would be another reason. Vomiting or nausea develops in the couple days after the surgery. If there's an increase in redness or if it looks to you after the bandage comes off that the wound seems to be coming apart would all be reasons to get back in touch with the doctor. Most children with this operation though have no complications and if there are complications they're pretty easily dealt with. So, enjoy this quiet time with your child and then enjoy getting right back to regular activity sometime in the next week.